After years of slow recovery after the recession that struck almost a decade ago, area construction firms are reporting strong volume in 2017 and predicting the same, if not better, in 2018. Whether relying on diverse expertise, a widening geographic footprint, or repeat business from loyal customers, there are plenty of ways to grow in the current economic environment, and contractors are optimistic they will do just that. Even during good times for the construction industry — which 2017 certainly was, to hear area contractors tell it — everyone still has to keep on their toes. While O’Connell is based in Holyoke, the firm has branched out over the years to develop a significant presence in Eastern Mass., Connecticut, and Rhode Island, particularly with large utility projects, while closer to home, it has maintained strong activity at area colleges and universities, including work at Amherst College and UMass, not to mention Dartmouth College in New Hampshire and Marist College in New York. However, the heavy civil side has been a different story, featuring projects like upgrades to the Uxbridge Wastewater Treatment Facility, a runway rehabilitation at Hanscom Airfield in Bedford (one of many projects for MassPort), and a biogas co-generation facility at the Bucklin Point Wastewater Treatment Facility in Rhode Island — not to mention some MassDOT highway work in Worcester and a pedestrian bridge over the Providence River. 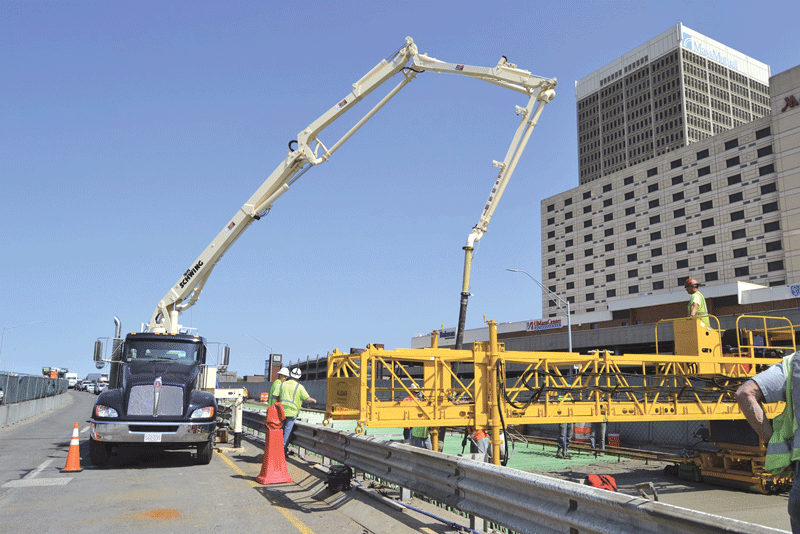 While margins are still tight, workload has remained busy, including two large mechanical upgrade projects for MassPort and increasing work at Logan International Airport over the past several years. Recent projects include a remodel of the Sunshine Village offices in Chicopee, Arrha Credit Union’s new West Springfield branch, a new office for Ameriprise Financial in South Hadley, two renovations for Oasis Shower Doors, an office renovation for Noonan Energy, and ongoing work for Ondrick Natural Earth and AM Lithography. Five Star Building Corp. opened its Boston office to handle a growing volume of business from the eastern part of the state. Clearly, these are high times for area builders, and they expect to keep rolling in 2018. Bardell said O’Connell’s broad geographic footprint — and its expertise in many different types of work — are both hedges against shifting economic tides. From a backlog standpoint, O’Connell is in pretty good shape, he told BusinessWest, but firms need to stay aggressive. “Talk to any contractor, and they’ll say they’re looking for more work; you burn it off quickly. But we’re here working through the holiday, with a lot of projects coming out in all kinds of places. There are projects in the Hudson Valley in New York out to bid right now, projects with Connecticut treatment plants, a very large university job in upstate New York, and some treatment-plant projects in Rhode Island. Now boasting 50 employees, Five Star has developed a strong presence out east as well, opening a Boston office to support the “booming” seaport and commercial construction happening there. 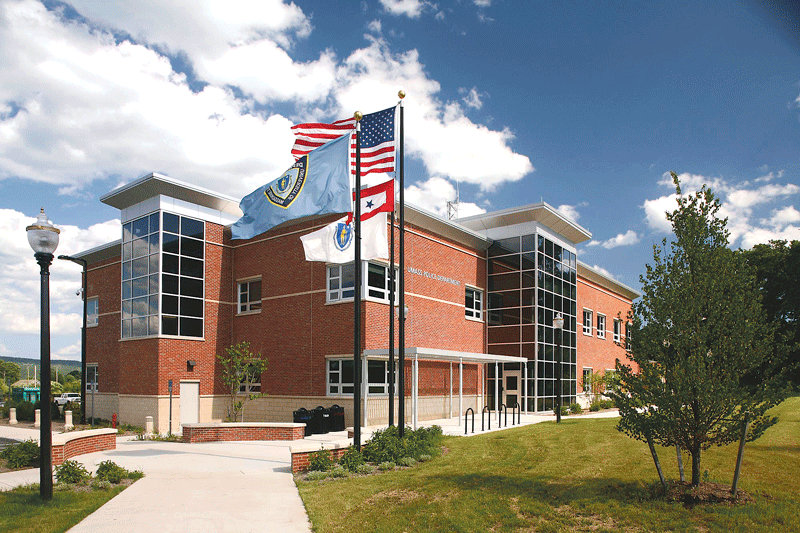 Long-term relationships with airlines like Southwest and Jet Blue have kept the firm busy at Logan, while projects like a new Westborough Town Hall, a library in Sherborn, a new charter school in Plymouth, and the Uxbridge fire station attests to the company’s diversity. Closer to home, major projects have included new life sciences laboratories at Holyoke Communtiy College and an ongoing upgrade of the entry at Noble Hospital in Westfield. 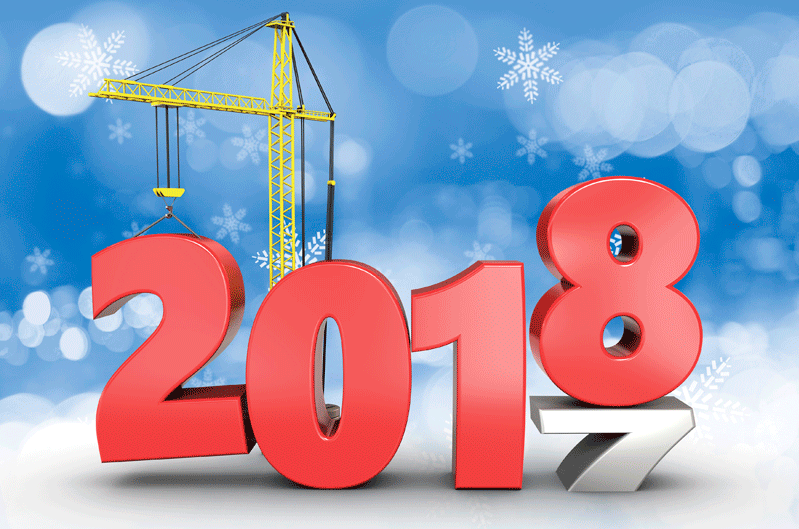 Perrier says contractors remember what the recent recession years were like — and how many years it took to return to something resembling normalcy — so everyone is a little gunshy, but they’re also optimistic that a strong 2017 will spill over into an even better 2018. Bardell added that most operations professionals in construction will say they don’t have enough good, quality workers. Not that high volume is a bad thing, of course. The Grand Concourse at Union Station before (top) and after. 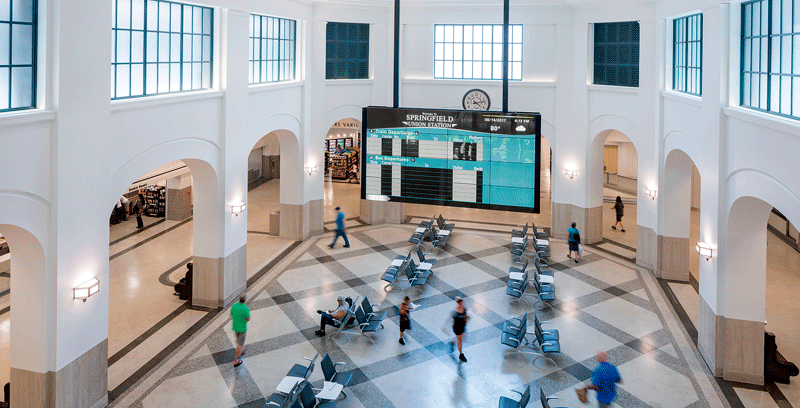 Springfield’s Union Station — and the project to bring it back to productive life after more than 40 years of dormancy — have both been described using a whole host of words and phrases. That was a new one, and one that most people probably wouldn’t expect to see the light of day. But Kevin Kennedy, Springfield’s chief Development officer, summoned it as he talked about the latest additions to what is becoming known as the Union Station trophy case — only there is no such thing. Yet. These would be two awards from the Environmental Protection Agency (EPA)— one for the best environmental rehabilitation project in New England region, and the second, announced after all the regional awards, is the so-called Phoenix Award, for the best brownfield redevelopment project in the country. This was the first such honor for the Western Mass. region, and to earn it, the Springfield project prevailed over a wide range of impressive initiatives, from transformation of 14 acres of former rail yards, junk yards, and auto-repair shops into a recreational center in New Jersey, to a stunning metamorphosis for the so-called ‘Big Marsh’ in Chicago. Indeed, while much of the focus on the station project has been on high-profile, highly visible initiatives, such as the façade, the parking garage, the new bus terminal, and the stunning transformation of the main concourse, all that wouldn’t have been possible without the environmental remediation work that came before it. This environmental cleanup involved the former baggage-building property adjacent to the terminal, which was demolished, and the former site of the Hotel Charles, said Kennedy, noting that the property had petroleum, metals, and asbestos contamination. Meanwhile, the project — creation of a new and expanded intermodal transportation facility — also addressed air quality and congestion mitigation. 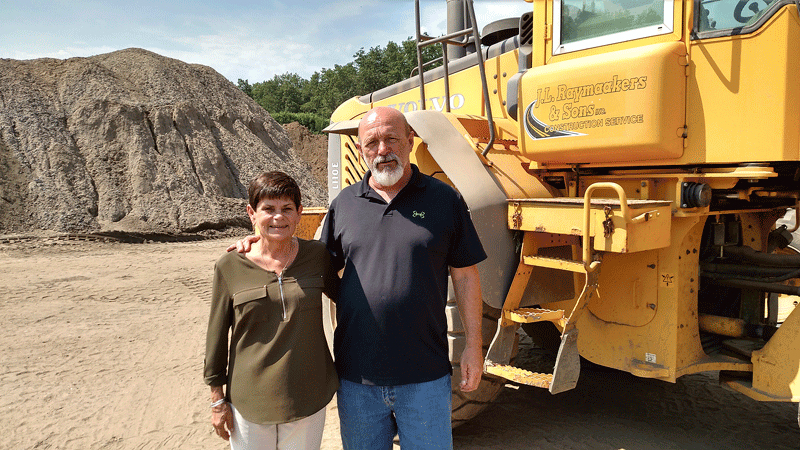 The Springfield Redevelopment Authority, owners of the building and managers of the redevelopment project, and lead contractor Daniel O’Connell’s Sons worked with a number of vendors to handle the remediation. The Westfield-based environmental engineering firm Tighe & Bond handled the analysis, specifications, and oversight of the work, while T&M Equipment Corp. in Springfield, LVI Environmental Services in Everett, American Environmental in Holyoke, and NCM Contracting Group in Weston handled various aspects of the cleanup and demolition work. But when Kennedy says the $95 million could not have come to its successful conclusion without that remediation, he really means it, and on many levels, from not only a construction standpoint, but also what would have to be called a momentum standpoint. Indeed, there were several times over the past few decades when the Union Station project was stalled, even dead in the water. But it was progress with the environmental issues that kept the project relevant and put it, well, back on track. The first was a $350,000 planning grant awarded by then-Gov. Deval Patrick that enabled the city to hire an architect to start the process of organizing the project, and the second was a roughly $250,000 EPA assessment grant to be used to identify to scope of the environmental issues at the site, including the baggage building and Hotel Charles footprint. 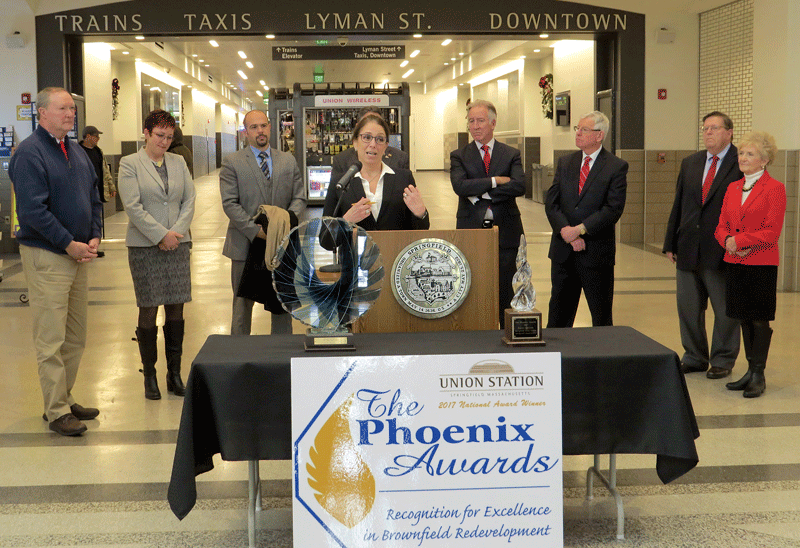 Lauren Liss, president and CEO of MassDevelopment, addresses those assembled at a press conference on Dec. 11 to announce that the Union Station project had won the Phoenix Award. In essence, the initial environmental work enabled planners to “get our arms around the project,” as Kennedy put it, enabling them to go back to the major funders, including the Federal Transit Authority and the Mass. Department of Transportation with a far sharper picture of what needed to be done at the site and what could be done with it. “There were so many of those boring things that those of us in the inside of the government had to put together,” he went on, adding that these boring, behind-the-scenes efforts, spearheaded by SRA director Chris Moskal and consultant Maureen Hayes, eventually made those stunning ‘after’ shots in the before-and-after scenarios possible. The environmental-cleanup efforts, and the project as a whole, were effectively summed up in the application for the brownfield awards, where Springfield officials listed the key project lessons as ‘resiliency.’ “A long-vacant train-station redevelopment project that had many starts and stops was restored to a state-of-the-art intermodal transit center thanks to the resiliency of its people and leaders,” the application reads. As for that reference to a trophy case, there really is one, as noted. But the Union Station project has collected a number of awards, including the two EPA prizes, the Paul and Niki Tsongas Awards from Preservation Massachusetts in the category called ‘Best Now and Then,’ the Springfield Preservation Trust’s 2017 Project Rehabilitation Award, and the Honow Award from the Assoc. of General Contractors of Massachusetts. Collectively, they speak to the enormity of the project and the significance of resurrecting a huge piece of Springfield’s past and making it a significant part of its future. As for it being a ‘bureaucrat’s delight,’ only the bureaucrats can truly say. A construction company doesn’t grow and thrive for almost a half-century — through some dramatic economic ups and downs — without the kind of client loyalty that makes it a go-to option for any number of job types. For Marois Construction, those include educational facilities, public buildings, medical offices, bank branches, and more. 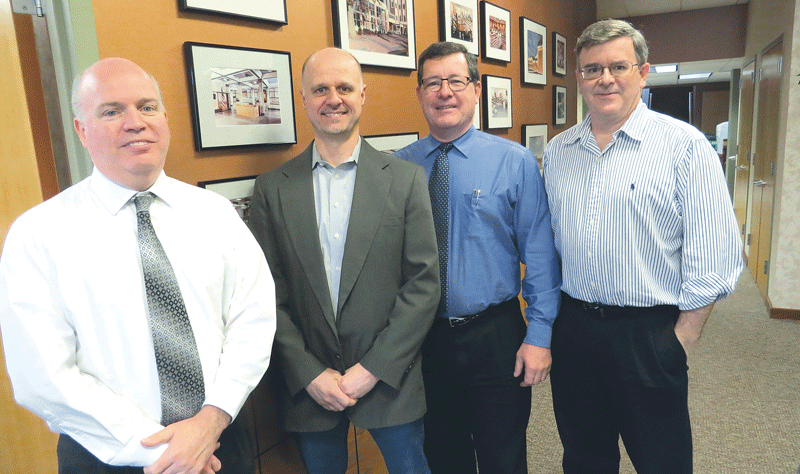 The firm has certainly left its mark on the Valley — with no signs of slowing down. There are advantages to being in business for 45 years. One is that it’s plenty of time to build a reputation. A lot of friends means plenty of repeat business, and that has been a key component of the success of one of the region’s iconic names in construction, an entity that quickly grew beyond its roots building cabinets and restoring furniture from a small shed. Five years after that humble beginning, Marois boasted seven employees and five trucks. Today, headquartered in a large building on Old Lyman Road, the company currently employs about 45 people. The repeat business has long been buoyed by the firm’s close relationships with area colleges and universities and expertise in niches as diverse as bank branches and medical offices. Current projects have the company busy at UMass Amherst, Elms College, a new Polish National Credit Union branch in Chicopee, the new state office building in Springfield, Veterans Memorial Cemetery in Agawam, and Central High School in Springfield, to put up a new press box and scoreboard. 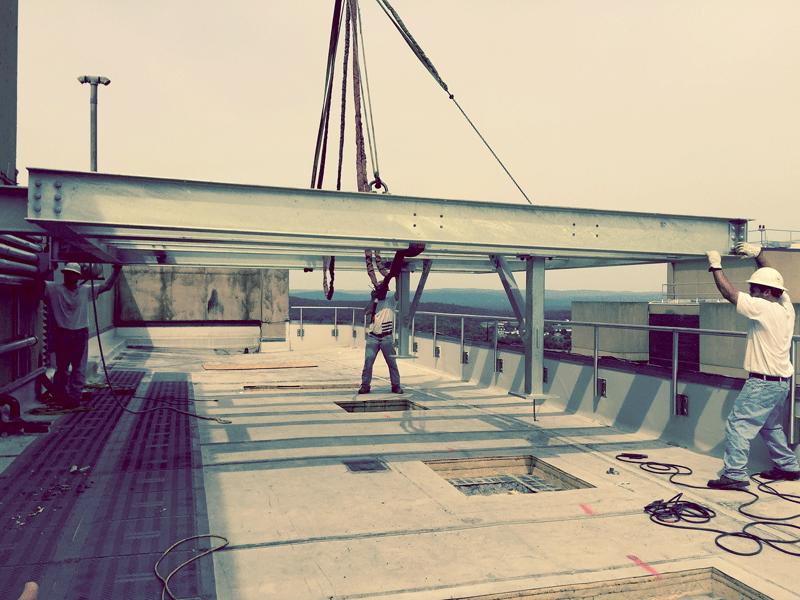 Marois Construction workers prepare to install equipment on the roof of John Adams Hall at UMass Amherst. In short, times are better for Marois — and for the industry as a whole, of course — than they were a few years ago, in the shadow of the Great Recession, when all firms were scrambling just to keep their crews reasonably busy. • An upgrade of the electrical and fire-pump systems at John Adams Hall at UMass, a residential tower, included installation of twin emergency generators on the roof of the 22-story building, placed on a new structural steel frame. • Also at UMass, a renovation of the Amherst Student Affairs Suite in the Whitmore Administration Building included the demolition of a 4,000-square-foot space, rebuilding of interior partitions, and finishes including porcelain tile flooring, recessed light fixtures, and a bamboo slat ceiling. • A project at Veritas Preparatory Charter School included more than 22,000 square feet of demolition and renovated spaces, including new classrooms, a science lab, a music room, a reception area, and office space. • The Keating Quadrangle at Elms College features the inlaid college logo and a large firepit that’s popular with students and staff. The project consisted of new drainage systems, underground electrical work, and multiple landscaping features including concrete, pavers, stone, and plantings. 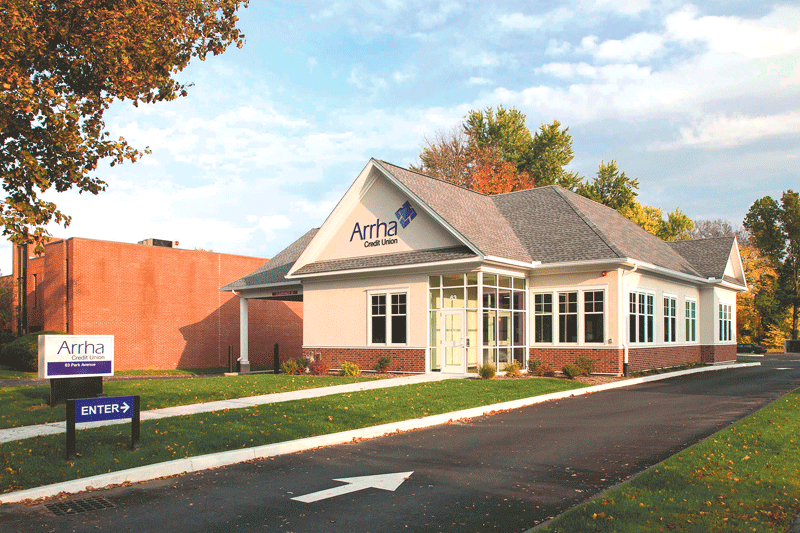 • On the medical side, the Raymond Center at Baystate Health – South Hadley Adult Medicine consisted of developing 14,000 square feet of primary-care space within an existing building. • At the Lee Hutt Gallery at the Yiddish Book Center in Amherst, the existing building was converted into a working sculpture studio, as Marois worked closely with the owner on all aspects of the design-build project. • The company also built a single-story addition to Plainfield Congregational Church to provide new bathrooms and meeting space. Site improvements included a new well, septic tank, and grading. Repairs and improvements to the existing structure included replacement of piers supporting the existing timber-framed floor, thermal improvements to walls, and more. • Marois also designed and constructed a facility to house supplies and equipment required to maintain the runways and grounds at Westover Air Reserve Base in Chicopee. 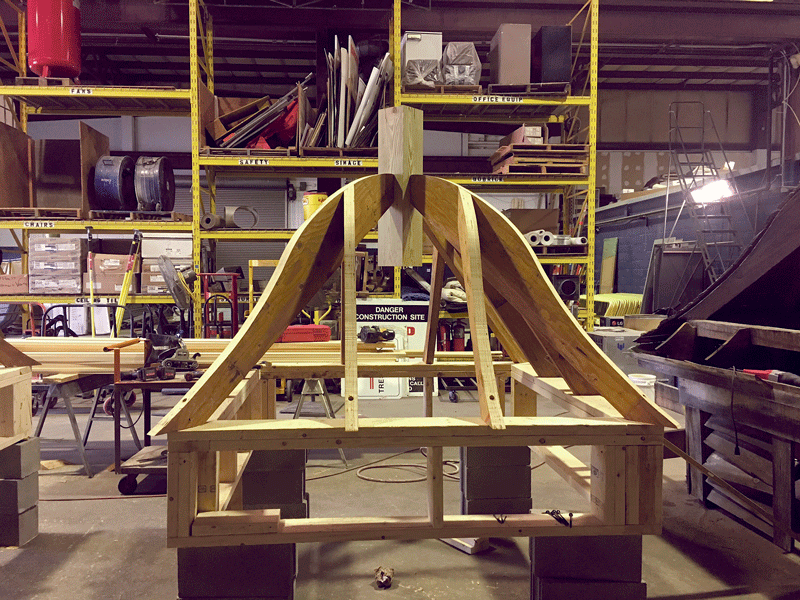 These cupolas are being designed for a project in Amherst. National data bear that challenge out. According to the Associated General Contractors of America, construction employment increased by 28,000 jobs in August, yet contractors still face a lack of experienced workers. Association officials say construction job growth would have been even higher had a majority of firms not reported having a hard time finding qualified staff. More than half of the survey’s respondents said they were having trouble finding carpenters, bricklayers, electricians, concrete workers, or plumbers, while some salaried positions, such as project managers and supervisors, are also hard to fill, Simonson added, noting that federal, state, and local leaders should act on measures aimed at recruiting and preparing more young adults for high-paying construction careers. “Exposing students to construction as a career path will encourage more of them to pursue these high-paying careers,” said Stephen Sandherr, the association’s CEO. Marois and Mercieri have an old-school ethos when it comes to quality work, but recognize that the way jobs are processed today is different than it used to be. Green building, however, is a building trend that has grown well past trendiness in recent years; instead, it’s standard operating procedure for many clients. 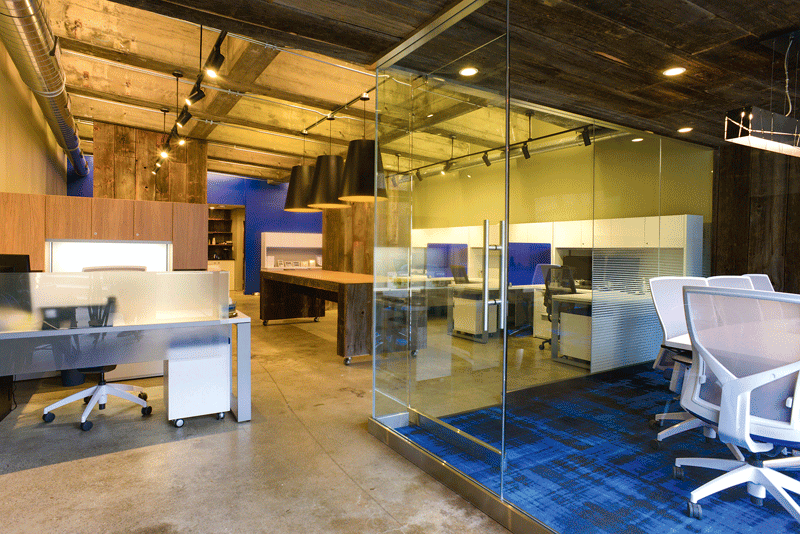 Marois has worked on multiple LEED-certified structures, but even those that don’t reach for those goals are subject to a new world of sustainability. The business has changed in other ways, too, such as Marois’ increased reliance on outsourcing some of the framing and demolition work than in the past, but he’s still keeping his crews active, after 45 years of loyal clients, technological advances, and economic ups and downs. Thanks in part to the U.N.’s “2030 Agenda for Sustainable Development,” ‘green’ building projects are increasing worldwide. From 2015 to 2018, the percentage of global builders with at least 60% of their projects certified green will double, according to the “World Green Building Trends” report. One of the main motivations driving green construction is to reduce carbon emissions, reports Interesting Engineering. And successful ways to do that revolve around energy usage — namely, to decrease energy consumption and increase energy efficiency in homes and buildings around the world. Here’s how those goals break down into the top five global green-building trends this year. The worldwide acceptance of solar as the energy of the future is causing solar technology to get better and cheaper — quickly. In 2016, India set aside $3 billion in state funding to ensure its capacity for solar power reaches 100 gigawatts by 2022. In May, the United Kingdom generated nearly one-quarter of its power needs from solar panels. And China is currently in the middle of creating the largest solar-thermal farm in the world. Huge, heavy panels with bulky grids are no longer the only options for a solar-roof install. In the U.S., Tesla has already rolled out its new solar shingles, while Forward Labs’ standing seam metal solar roofing is set to be released in 2018. In Australia, Professor Paul Dastoor of the University of Newcastle is performing the final trials on lightweight solar panels made by printing electronic ink onto plastic sheets. These solar panels are cheap to produce and ship and could potentially be a game changer for the solar-panel industry. “Batteries capable of storing power at utility scale will be as widespread in 12 years as rooftop solar panels are now,” estimates Bloomberg New Energy Finance. And that makes sense, considering the same type of lithium-ion battery used to power an electric vehicle can also be used to store power in the home. This double demand enables manufacturers to increase battery production, which drives down prices. And lower prices mean home batteries will be within reach of more people. Some major players have already jumped in on the home-battery-manufacturing opportunity. Mercedes-Benz has produced suitcase-sized at-home energy storage for Germany since 2015, but it plans to expand internationally and has recently made the product available to California residents in the U.S. Meanwhile, Powervault is the number-one at-home battery manufacturer in the UK, and ElectrIQ is one of the newest home-energy-storage manufacturers in the U.S., with a home battery that stores 10 kWh of energy. To get the most out of solar panels and batteries, energy-management systems (EMSs) are often installed in green homes and businesses. EMSs monitor how much energy a building uses and can automate lighting, power, and HVAC systems to ensure optimal energy savings. For example, the Edge, a building in Amsterdam that won the BREEAM award for offices in 2016, has 30,000 sensors that connect to a smartphone app. This app collects data from office employees and adjusts temperature and lighting according to how many people are inside the building and even keeps track of individual employee’s air and lighting preferences. Another example is Honda’s smart home in the U.S., which has an experimental home EMS that communicates with the electrical grid to create optimal energy performance. Passive building designs help minimize energy consumption by reducing the need for electrical lighting and temperature control in the first place. How? 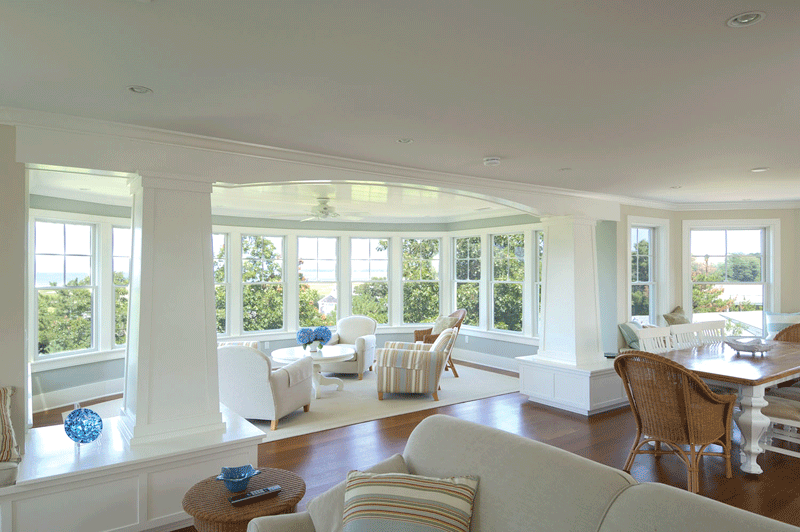 By using advanced design techniques that allow for maximum amounts of natural daylight to come in, while restricting heat loss in the winter and reducing heat gain in the summer. And one element of passive design that has a big impact in temperature control is what goes on the roof. Green roofs play an important part in helping regulate the temperature inside and outside of many passive buildings and homes. The plants and soil systems put in place help insulate the building in the winter and shade it in the summer. Reclaimed wood and recycled materials are high on the list of sustainable building supplies. But there’s also a lot of innovation happening in the world of eco-friendly concrete. Why is making concrete green so important? Because it’s the world’s most used construction material, and it’s responsible for producing copious amounts of CO2. There are several concrete alternatives, such as AshCrete, Ferrock, and HempCrete — but the most recent buzz is self-healing concrete. This concrete is supplemented with bacteria that, when exposed to moisture, will become active and grow limestone that will fill any cracks that happen over time. This is a big deal since no added concrete is needed to maintain it. Luckily for us, this worldwide trend of creating green building solutions will grow along with the burgeoning demand for better ways to sustain our planet. Maybe soon, the term ‘green building’ won’t be needed because all building practices will be sustainable. This article first appeared in Proud Green Building. As federal and state lawmakers continue to search for solutions to fund and finance critically needed transportation infrastructure, the latest America THINKS national public opinion survey by infrastructure-solutions firm HNTB Corp. finds Americans with definitive views on how that funding should be generated and who should be responsible for maintaining and building the nation’s transportation network. According to the survey, “Paying for Infrastructure – 2017,” 70% of respondents expressed their willingness to pay higher taxes and tolls to maintain existing as well as build new infrastructure. That number jumps to 84% if those revenues are guaranteed by law to exclusively fund transportation infrastructure needs. “Americans value mobility and are willing to pay more to maintain and grow transportation infrastructure, especially if they know how their money will be used,” said Kevin Hoeflich, HNTB Toll Services chairman and senior vice president. The HNTB survey also found nearly three in four Americans (73%) support public-private partnerships as a way to maintain existing and build new transportation infrastructure. Fifty-two percent believe the responsibility for funding maintenance and building new transportation infrastructure should be shared by the government and private sector. The desire to avoid congestion and save time is behind the willingness of almost six in 10 Americans (59%) to pay a toll, even when a free alternative is available, according to the HNTB survey. Of these respondents, 57% are willing to pay an average of $1.70 to use a priced managed lane, also called express lanes, if that would save 15 to 30 minutes of time, avoid congestion, and provide a predictable travel time. The conversion of general-purpose interstate lanes to priced managed lanes is supported by 77% of survey respondents. Among this group, 50% believe reducing congestion is the most important reason for this conversion, an increase from 43% from the same question asked in a 2016 HNTB survey. HNTB’s survey found 80% of respondents support adding tolls to existing highways and interstates. When asked how those toll revenues should be used, reducing congestion was cited by 41% of respondents; improving safety, 40%; adding vehicle capacity, 34%; and adding transit capacity, 21%. Twenty percent of respondents would never support tolls on existing highways or interstates. The survey also found two-thirds of respondents (66%) support tolls to fund critical infrastructure projects if there are insufficient funds from other sources. Meanwhile, the concept of reduced toll rates for low-income users is supported by more than three in four Americans (76%). “Most importantly, there is growing recognition of tolls as a source of revenue that can help fund decades of neglect of maintenance and operations, system improvements, and other critical transportation needs,” said Hoeflich. HNTB’s America THINKS “Paying for Infrastructure – 2017” survey polled a random nationwide sample of 1,027 Americans, ages 18 and older, between July 14 and July 16, 2017. Andy (left) and A.J. 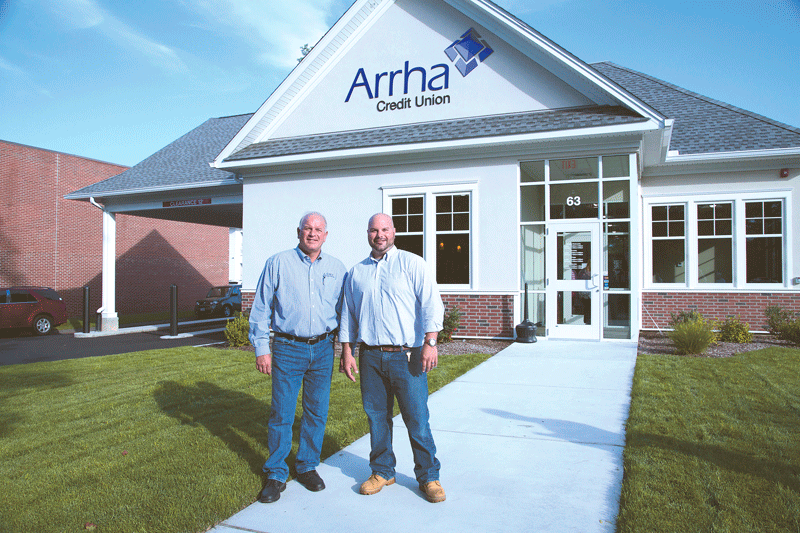 Crane stand before a recent project, Arrha Credit Union’s new West Springfield branch. “Well, we finally did a bridge,” his son, A.J. Crane, happily told BusinessWest recently, showing off some pictures of a small span over a culvert, connecting the former Chap de Laine’s Furniture site in South Hadley — incidentally, one of Crane’s first clients almost three decades ago — to Newton Street. It’s just one example, said the younger Crane — who runs the company alongside his father — of how A. Crane has expanded its scope over the past decade, assembling a broader book of business in the commercial-building world and branching out into new realms. For example, the company is in the process of completing a remodel of the Sunshine Village offices in Chicopee; other recent projects range from Arrha Credit Union’s new West Springfield branch to a Dairy Queen renovation; from a new office for Ameriprise Financial in South Hadley to a major renovation for Oasis Shower Doors, as well as ongoing work for Ondrick Natural Earth and AM Lithography. As it approaches its 30th anniversary next year, the firm has come a long way since its humble beginnings in Chicopee in 1988, when it relied mainly on word of mouth, reputation, and loyalty — and that willingness to tackle any type and size of job — to build a healthy clientele. Andrew Crane started in the construction world working for Daniel O’Connell, and from there spent eight years with a family business that built post-and-beam homes before striking out on his own. For the better part of two decades, he conducted business out of a house in Chicopee, doing jobs only for people he knew personally. A little over a decade ago, he moved to Grattan Street, but has outgrown that space as well and has begun looking for a larger headquarters in the same city. In a fiercely competitive industry, the father-and-son principals say they have avoided the low-bid trap by cultivating a reputation for attentive service and quality control — and a stable of loyal clients — allowing them to earn realistic profits and grow the business without cutting corners. 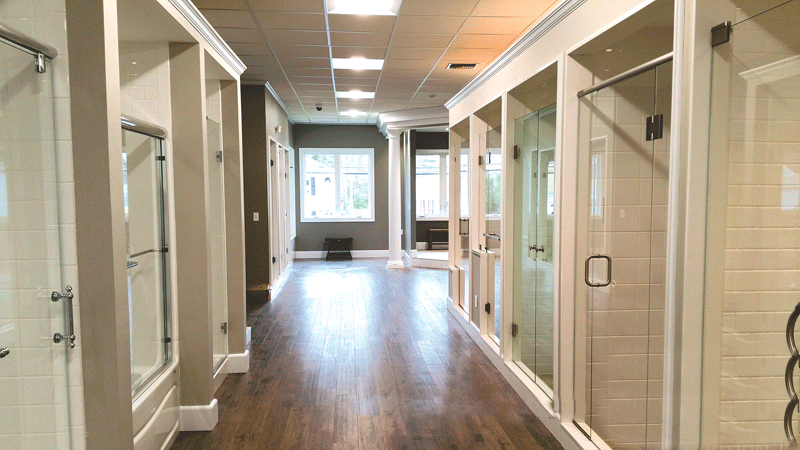 A. Crane Construction recently tackled a major renovation from Oasis Shower Doors. No contractor was unscathed by the Great Recession, which impacted construction, particularly residential work, as hard as any industry. But A.J. Crane said the firm’s reputation and relationships kept it afloat. While seeking a diverse roster of work to keep crews busy, Crane says the company’s relationship-based style of doing business is especially appreciated by local clients, as opposed to national chains. Indeed, quality and sustainability are important to the Cranes; Andrew has been heavily involved with the Home Builders & Remodelers Assoc. of Mass., including a stint as president, during which time he advocated at the state level for continuing-education requirements for construction supervisors, as well as more stringent building codes requirements aimed at weeding out small, renegade contractors who use shoddy materials or fail to secure proper insurance. The rise of ‘green’ construction brings its own set of high standards, and A. Crane has done plenty of that type of work as well. Through the years, A. Crane has seen a roughly even split between homebuilding and commercial work, but its experience with multi-family residential work — for instance, it recently won a contract from a condominium association to build 60 decks — was one of the factors in the firm’s move into property and condominium management. The service is a valuable one for smaller companies — say, with a footprint of 6,000 to 7,000 square feet — that don’t have their own maintenance department, and don’t do much long-term facilities planning. A. Crane employs 11 people full-time, but on any given day, there may be 65 in the field, he noted. In addition, the firm supports and sponsors dozens of area organizations, from Sunshine Village to local high schools to the Springfield Thunderbirds. Andrew continues to pursue state-level advocacy with organizations like the Massachusetts Convention Center Authority and the Home Builders & Remodelers Assoc. of Massachusetts, while A.J. serves on the boards of the Western Mass. chapter of the American Red Cross, the Chicopee Chamber of Commerce, the Westmass Area Development Corp., and several other entities. A. Crane Construction plans to be around well past its 30th anniversary, building many of those homes and businesses so crucial to a growing Pioneer Valley. 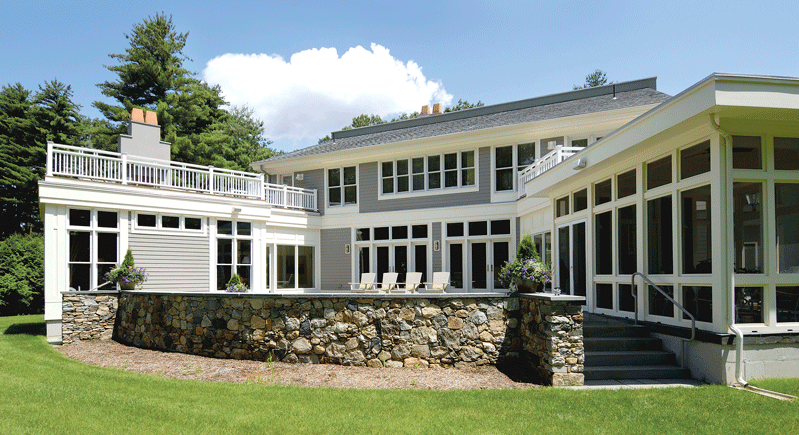 An example of Laplante Construction’s work creating both indoor and outdoor spaces. When it comes to custom homes, trends come and go, but buyers are always looking for the next big thing — or, to be more accurate, the next not-so-big thing, as one of those trends favors downsizing in favor of easier maintenance and more energy-efficient touches. But high-end homebuyers aren’t shorting themselves on the interior; they still want the best floors, trims, and technology money can buy. And many are turning to Laplante Construction to get the job done. 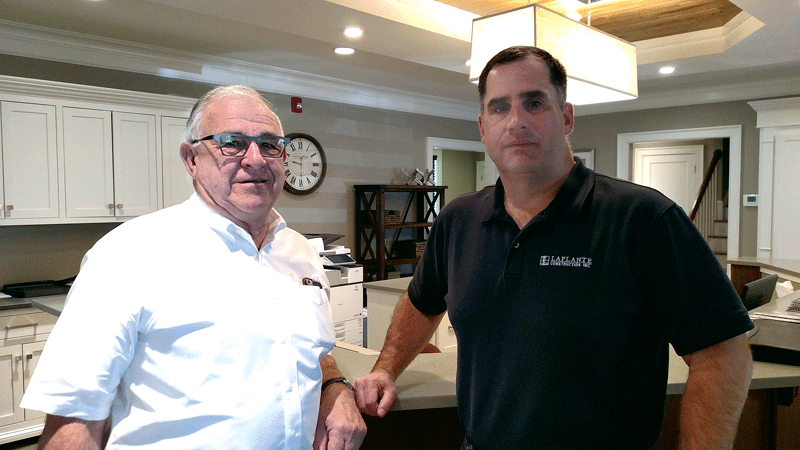 Ray and Bill Laplante both grew up around the construction business, so it’s not surprising they’ve made a name among the region’s top luxury home builders. At the time, duplexes were in vogue in Springfield, and he cut his teeth there, but soon started building custom homes in Longmeadow, Wilbraham, East Longmeadow, and surrounding towns. “Business just took off from there,” he said, and soon he was developing entire subdivisions of high-end residences in those communities. His son, Bill, grew up in the business too, helping on job sites when he was only 13 years old. He graduated from Trinity College in 1992 with a degree in economics, but a few days after graduation, he was back out on job sites, where he worked for about five years, framing houses and performing myriad other tasks. But, though the experience was invaluable, his heart wasn’t in the field. 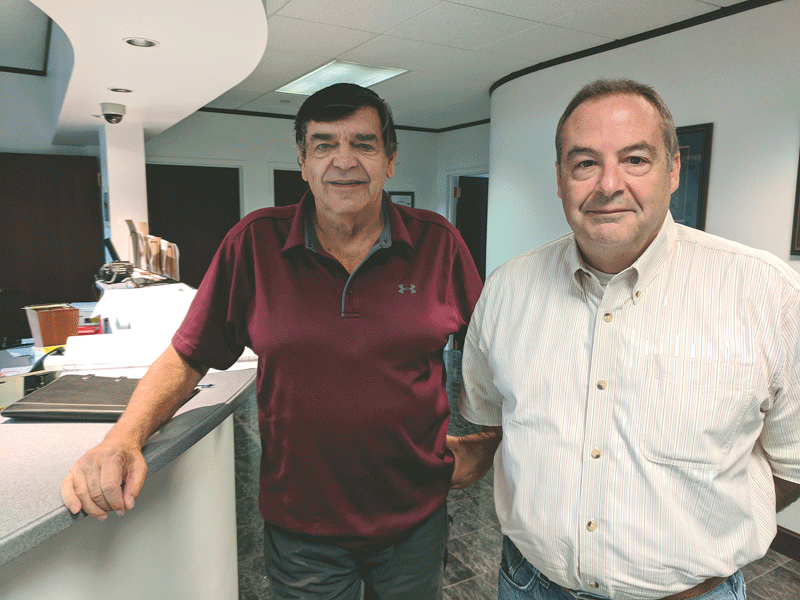 Company founder Ray Laplante (left) and President Bill Laplante say a healthy mix of residential and commercial building and remodeling keeps their business thriving. That’s the part of the business he enjoyed most, Bill said — working with clients on the big picture, and shepherding their vision to reality. Today, Bill Laplante serves as the company’s president, working alongside its founder to bring those visions to life — including, in 2014, a replica of Thomas Jefferson’s famed Monticello estate in Somers, Conn. But luxury homes are only one staple of this family business, as it expands its reach in commercial construction as well, delivering a range of building and remodeling services with the diversity to weather economic cycles and record continued growth. That’s not quite true, of course, as both he and Bill acknowledged that Monticello Somers, built at the behest of Friendly’s co-founder S. Prestley Blake, was a once-in-a-generation project. Ray and Bill Laplante designed the project themselves based on copious research into the original Virginia estate, creating a ‘modernized replica’ that’s historically accurate in the façade, yet decked out in 21st-century amenities inside. To be sure, custom finishes, modern touches, and code compliance have long been facets of Laplante Construction’s work building and renovating high-end homes in the Greater Springfield region. But, contrary to a Monticello-scale project, Bill said the trend in luxury homes today is moving away from massive floor plans and toward spaces that are smaller, but still pack all the bells and whistles. While many homeowners are looking to downsize, Bill Laplante says, the company still puts up plenty of large homes. He credits a desire for a simpler lifestyle; people are staying home more and enjoying the space they have, but don’t necessarily want to maintain a sprawling estate. That goes for remodeling as well, Bill added, which has long been a critical part of the business — which was fortuitous when the market for custom homes dried up in the years following the financial crash in 2008. These can all carry hefty price tags, but, interestingly, other home costs have come down in recent years, notably whole-home technology — the devices that control heat, cooling, lights, security cameras, and irrigation remotely. No matter the size of the home, Bill and Ray Laplante say, clients want the interior well-appointed with high-end flooring, tile, trims, and technology. Homeowners appreciate the cost reductions in that area, as they do the savings they realize from energy-efficient investments. “Because of the spike in energy costs a few years ago, everyone became much more concerned with energy efficiency,” Bill said. “When people move from 4,000-square-foot homes into smaller, higher-energy-efficiency houses, they’re shocked by the savings in operating costs. We’re doing a lot with spray-foam insulation, energy-efficient windows, air sealing, and super-energy-efficient heating and cooling equipment. Then there are people who want to go even further, into geothermal heating as well as photovoltaic and solar. Laplante Construction is widely recognized as a custom home builder, but its commercial roster is deep and far-reaching — and has been expanding over the past decade. That mix of expertise promises to keep Laplante growing as it moves forward with what has been one of its best years in the past decade. An overhead view of work on the inner lanes of I-91’s Springfield viaduct. 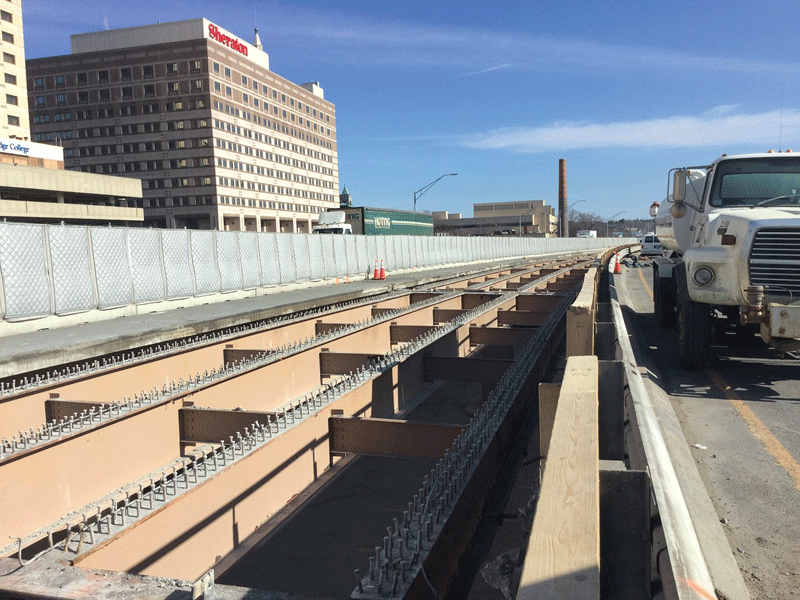 In May 2015, the Massachusetts Department of Transportation signed a $148 million contract with the Joint Venture of JF White-Schiavone to overhaul the 1-91 viaduct in Springfield. The project is immense in scope, and although it has inconvenienced drivers, especially during peak hours, it is ahead of schedule and brings concrete benefits for the local economy and area businesses that manufacture or provide products needed for the repair and reconstruction of the 45-year-old section of highway. Richard Masse says that, when the state Department of Transportation (or MassDOT, as it’s called) developed plans for reconstructing the 1-91 viaduct that runs through Springfield, it was well aware of the impact and inconvenience the project would have on drivers traveling north and south. Indeed, state officials felt that completing the $148 million project on time or ahead of schedule was so critical that they built an attractive bonus into the contract to keep work moving along as quickly as possible. 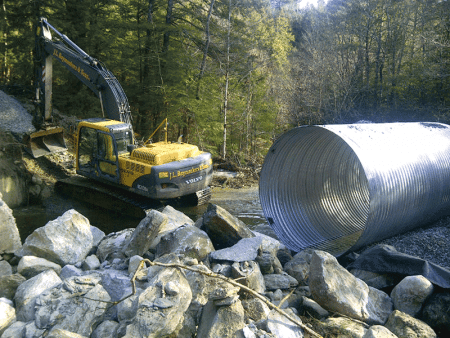 “We established an incentive of $50,000 a day for up to 180 days to finish earlier than the contract specified,” said Masse, district project development engineer for MassDOT Highway Division District 2. This equates to a potential bonus of $9 million for the Joint Venture of JF White-Schiavone if specific conditions are met. And those conditions are clearly outlined: the entire project does not have to be complete, but the ‘full beneficial use’ milestone has to be met, which means work on all lanes and ramps must be finished, and they must be open and functioning, before Aug. 6, 2018. This constitutes the majority of the work. Such incentives are rare, and this is the largest ever offered by District 2, but it is tempered by a disincentive: There will be a penalty of $50,000 for every day the contractor is late in meeting the milestone. But that’s not likely to happen. In fact, JF White-Schiavone, benefiting from mostly benign weather (the recent storm was a definite exception), is three months ahead of schedule, and workers continue to labor around the clock to get the project done. The roadway under reconstruction is only eight-tenths of a mile in length, but the work involves far more than simply removing the old decking on the six traffic lanes and repaving them. There are 96 separate spans of bridge between the south abutment on State Street and the north abutment near the I-291 exit, and each span is supported by a pier that needs to be repaired. Officials say the viaduct project is proceeding ahead of schedule, thanks to relatively mild winters and some attractive incentives. In fact, the $148 million contract holds enormous weight — literally and figuratively — and area businesses are benefiting due to the materials that are needed and will be used by the time the project is complete. Specifically, crews will replace 44,000 tons of concrete with the new bridge deck and barriers, use 7.2 million pounds (3,600 tons) of steel reinforcement, install 134 drainage inlets on the bridge, erect 2.5 miles of snow fence on the barriers, and paint 28 acres, or 1.2 million square feet, of steel. Concrete is being purchased from Construction Service in Wilbraham, asphalt paving comes from Lane Construction Corp. in Springfield, the 600-plus feet of noise-control curtains mounted in front of downtown hotels were purchased from Sound Seal in Agawam, and gravel and stone is being provided by Ginmar Enterprises in Ludlow. In addition, Commonwealth Guardrail in Westfield is furnishing that product, all catch basins and manhole castings will be purchased from E.J. Prescott Inc. in West Springfield, and CJ’s Towing Unlimited Inc. in Springfield is part of the safety plan to remove vehicles involved in crashes as quickly as possible, which is important because traffic is already squeezed between the barriers on the viaduct. The project has also had a positive effect on employment. The Federal Highway Administration has done studies on the impact of major undertakings and reports that every $1 billion in spending supports 13,000 jobs for a year. “Since this project will cost $148 million, that translates to more than 1,900 job years of employment that are either created or supported,” Masse said. For this issue and its focus on construction, BusinessWest takes an indepth look at the I-91 project — what’s been completed, what’s still to come, and what the long-term benefits will be for Springfield and the region. Although some people think the $950 million MGM Springfield resort casino has affected work that is being done on the viaduct or the way the on and off ramps will be configured in the future, it’s not true and simply a coincidence that construction on both projects is taking place simultaneously. “We identified the need for the viaduct project late in 2011 before expanded gaming was even signed into law, and the project was approved and initiated prior to any casino proposals,” said Masse. The viaduct was constructed and opened in 1971, and no improvements were made to it other than a few limited repairs that took place between 1999 and the early 2000s. As a result, the decking deteriorated as millions of vehicles passed over it and chemicals, salt, and sand were used to combat ice and snow during frigid winter months. “It had reached the point where emergency repairs of potholes were becoming routine. We had to go out on the road in the middle of commuter traffic without warning, and it became clear that it was time for a long-term fix,” Masse said. MassDOT did its best to identify challenges that might occur as it developed a plan for the project. The agency determined it was critical to keep the public informed about what was happening on a daily basis, so the contract contained language that mandated hiring a public-relations firm for that purpose. Regina Villa Associates in Boston was chosen, and the company issues frequent notices and updates about the work in progress to all local media outlines. There is also a project webpage (www.massdot.state.ma.us/i91viaductrehab/home.aspx) where people can sign up to get e-mail alerts about daily or weekly changes. In addition, work on the project is discussed at biweekly meetings that include officials from MassDOT, the Springfield Department of Public Works, the Springfield Parking Authority (two of its main facilities are under the viaduct), and MGM Springfield. Masse noted that the casino has initiated its own street closings and plans to install a detection system at the end of the exit 6 ramp to facilitate traffic flow and help prevent accidents; if traffic starts to back up toward the highway, the stoplight will change to allow vehicles to move off the ramp. Other work is also being done on streets around the casino, but that has no bearing on the 1-91 viaduct project. Although some media outlets have reported that a number of drivers have avoided the viaduct and will continue to do so until the project is complete, Masse said everything possible is being done to reduce the impact on local businesses. “We understand that our projects are generally an inconvenience, and we certainly appreciate that there can be some negative impact on local businesses. But we haven’t had any feedback of that nature,” he told BusinessWest, adding that business owners as well as the general public are invited to send comments, suggestions, or inquiries to MassDOT via the project website, and feedback has already resulted in things such as adjustments to signage. Richard Masse says that, when it’s completed, the reconstructed viaduct will help make Springfield an attractive destination. Another change that went live Feb. 1 was made in response to input from drivers who expressed concern about safety where lanes on I-91 South are reduced from two down to one. The feedback led MassDOT to implement a pilot program for a ‘dynamic lane merge system,’ which is designed to make merging safer and alleviate congestion. It’s the first time this system has been used in the Commonwealth, and it will help to ensure that vehicles familiar with the lane closure don’t bypass others and cause them to wait for a longer period of time than those who use the roadway on a frequent basis. The system works by using computer sensors to monitor traffic and letting drivers know what the best merge strategy is via electronic signage. The viaduct project has many goals, including replacement of the reinforced concrete bridge deck, painting of all structural steel, replacing the bridge bearings, improving bridge drainage and highway lighting on and under the structure, miscellaneous structural steel repairs, improving traffic signage on the structure, and other safety improvements in the immediate vicinity, such as installing new sprinkler systems and LED lighting on the upper levels of the 1-91 North and South parking garages, which are run by the Springfield Parking Authority in space leased from the state. Masse said the project was divided into two main phases so half the decks could be replaced at a time. Last year, work was concentrated on the inside decks, and traffic was moved to the outside, and now that phase I is complete, the process has been reversed, and construction is taking place in the low-speed travel lane and shoulder portions of the viaduct, and on the I-91 northbound on-ramp to I-291 East. The same ramps that were closed during phase I will remain closed, and the only change is that the exit 9 off-ramp from I-91 North to Route 20 West/Route 20A East will be closed until phase II is complete. About 100 people show up to work at the site every day, and in addition to day and evening shifts, construction efforts often continue throughout the night. The noisy work of demolishing the existing decks is done during the day, and debris is carried away after dark. “The crews use very large jackhammers mounted to excavating equipment to break up the deck,” Masse said, noting that saws are also used to cut portions of the material. Workers recently began painting the steel girders, which is no small task — again, there are 1.2 million square feet of steel to repaint. But when the job is complete, it will help enhance the perception of that section of the highway. “The beige paint that had reached the end of its useful life is being covered with a blue-green hue that will be much more attractive visually,” Masse said. In addition to aesthetics, safety will be improved. “When we finish the deck replacement, the shoulder on the median side in the high-speed lane will be wider,” he continued, explaining that, in the past, there were two feet between the guardrail and the edge of the road, but a narrower concrete barrier will allow the inside shoulder to expand to four feet in width. Other safety improvements include the construction of a barrier to stop I-291 traffic from shooting across several lanes on I-91 South to exit 7 at the Memorial Bridge. When the project was in the development stage, Masse noted, input about this dangerous maneuver led MassDOT to make plans to install the new jersey barrier. The number of drainage inlets will also be increased, which will reduce the amount of water that collects along the shoulder of the roadway. After the roadways are fully open, the remaining work will commence, and by the time the project is finished, the structural steel will be painted, municipal street lights will be installed, all final paving and traffic markings on local streets will be finished, temporary traffic signals will be replaced with permanent ones, and the temporary off-ramp from I-91 South to Birnie Avenue will be removed. There is no doubt that the project is an inconvenience to drivers who have to schedule additional time to get to their destinations. But the benefits will be concrete: sales of products used in construction will help local companies to flourish, and drivers will have a safer and more appealing roadway to travel on between downtown Springfield and the Connecticut River.